Abstract: Multivariate pattern analysis (MVPA) has revealed that information is encoded in finegrained patterns of cortical activity that can be measured with fMRI. Study of cortical functional connectivity also has revealed fine-grained topographies in the connectome that are closely related to these patterns of activity. The surface structure of functional cortical topographies, however, allows considerable variability across brains for encoding the same information. We introduced a new conceptual framework with computational algorithms that make it possible to model the shared information that is encoded in fine-grained functional topographies that vary across brains. This framework, “hyperalignment”, models shared information as a high-dimensional information space, rather than attempting to model a shared or canonical topographic structure in the physical space of cortical anatomy. Hyperalignment is based on computational algorithms that discover this space and calculate transformations that project individually-variable patterns of neural activity and connectivity into the common model information space. Research Focus: My current research focuses on the development of computational methods for building models of representational spaces. We assume that distributed population responses encode information. Within a cortical field, a broad range of stimuli or cognitive states can be represented as different patterns of response. We use fMRI to measure these patterns of response and multivariate pattern (MVP) analysis to decode their meaning. We are currently developing methods that make it possible to decode an individual’s brain data using MVP classifiers that are based on other subjects’ data. We use a complex, natural stimulus to sample a broad range of brain representational states as a basis for building high-dimensional models of representational spaces within cortical fields. These models are based on response tuning functions that are common across subjects. Initially, we demonstrated the validity of such a model in ventral temporal cortex. We are working on building similar models in other visual areas and in auditory areas. We also plan to investigate representation of social cognition using this same conceptual framework. Visitors from UCHC are encouraged to use the UCHC-Storrs shuttle service. Talks can also be joined remotely. Please contact us if you are interested in meeting with the speaker. Since the opening of the University of Connecticut (UConn) Brain Imaging Research Center (BIRC) in June 2015, there has been an increase and diversification of user-base, neuroimaging-related extramural grants, and neuroimaging expertise of students and faculty. However, there is still room for greater utilization of BIRC, which presents opportunities for BIRC to offer the resources to perform high-profile and neuroimaging-intensive research that other fully occupied imaging centers cannot offer. The BIRC Trailblazer Award was created to allow research teams to perform cutting-edge research and/or perform research that will benefit the BIRC community at-large. The objective of the 2019 BIRC Trailblazer Award is to fund: (1) high-risk high-reward projects with exceptional innovation that lead to raising the visibility of UConn, College of Liberal Arts and Sciences (CLAS) and BIRC; and/or (2) projects that will benefit the BIRC community at-large (e.g. methods development). The project is intended to lead to high-profile peer-review publications, release of a public database, and/or work that is cited and utilized by large-number of UConn researchers in their grants and manuscripts. The project should also lead to large-scale and high-profile extramural grant applications shortly after the end of the funding period. Abstract: Psychiatric neuroimaging has been based primarily on group inferences, but this research has not fundamentally altered patient diagnosis or treatment. The future quality of healthcare in psychiatry will benefit from a timely translation of basic research findings into more effective and efficient patient care. I will describe ways in which the intrinsic functional architecture of the human brain, as elucidated by resting state networks (RSNs), can provide neuro-markers supporting 1) early identification of individuals at risk for mental health difficulties, so that perventive treatment can reduce or even avert future difficulties, 2) neuroprediction, aimed at personalized or precision medicine targeted for selection of an optimal treatment program, and 3) cutting-edge, noninvasive, behavioral interventions such as mindfulness based real-time fMRI neurofeedback, used to augment current available treatments and limit the progression of psychiatric disorders. Bio: Susan Whitfield-Gabrieli is a Professor of Psychology and Founding Director of the Interdisciplinary Science and Engineering Complex (ISEC) Imaging Center at Northeastern University with affiliation also at the McGovern Institute for Brain Research at MIT. Her primary mission is to understand the brain basis of psychiatric disorders and to promote the translation of this knowledge into clinical practice. Towards this end, she employs multimodal neuroimaging techniques to investigate the pathophysiology of psychiatric and neurodevelopmental disorders such as schizophrenia, depression, bipolar disorder, ADHD, autism, and dyslexia. Her goals are to discover biomarkers for improved diagnosis, early detection (potentiating early intervention and possibly prevention), prediction of the therapeutic response (targeted towards precision medicine), and development of novel therapeutic techniques (e.g., real-time fMRI neurofeedback) with the hope of improving (or augmenting) currently available treatments. A secondary goal of her research is to develop functional imaging analysis tools to share with clinicians and the neuroimaging community at large. UConn Health patients in eastern Connecticut will now be able to get MRI scans done in Storrs just as if they were at UConn Health in Farmington, thanks to a collaboration between doctors and researchers at the two campuses. UConn’s Brain Imaging Research Center (BIRC) houses a powerful 3 Tesla Magnetic Resonance Imaging (MRI) scanner that was installed in 2015 and originally dedicated purely to research. The BIRC’s machine can take detailed pictures of fine structures in the brain. It can also do functional MRI, which shows subtle changes in blood flow in the brain as a person thinks. Medical details – tiny flecks of blood that might signal a concussion, or small injuries to the spine or extremities – also show up beautifully on the scanner. But the state had not previously licensed the BIRC’s machine to perform medical work. Doctors at UConn Health and researchers at the BIRC thought that should change. So he began working with former BIRC scientific directors Inge-Marie Eigsti and Jay Rueckl, and more recently BIRC director Fumiko Hoeft, along with regulatory and business development staff at UConn Health, to get permission from the state to use the center’s machine for medical imaging. Then, with the help of UConn Health MRI technologist Brian Hausner, MRI service manager Elisa Medeiros installed protocols to run clinical scans. The picture archiving communication system team at UConn Health oversaw the setup of the hardware needed to transmit medical data securely from the BIRC, which is located in the Phillips Communication Sciences Building in Storrs, to UConn Health in Farmington. 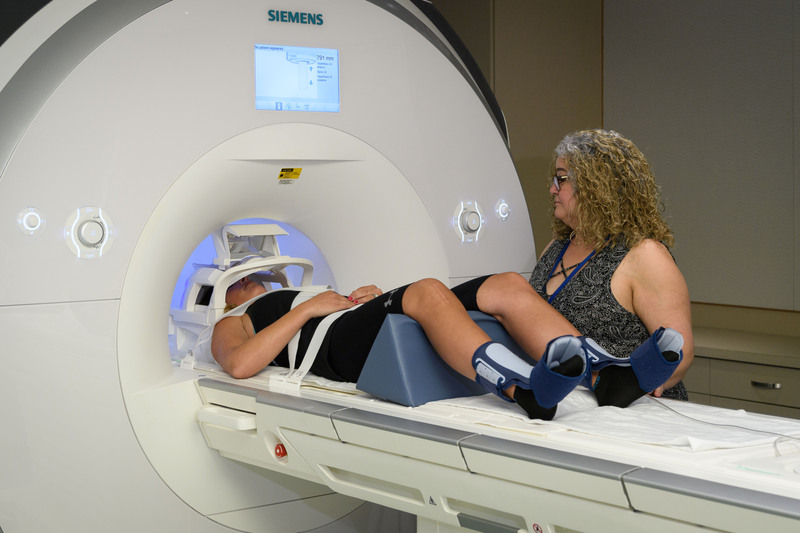 It took months of work, but on Nov. 7, the BIRC scanned Clinical MRI Patient #1. The term “Clinical MRI Patient #1” had a double meaning. It referred to the first clinical scan chronologically, but it was also a HIPAA-compliant way to refer to the top executive at UConn, President Herbst, who agreed to be the “test case.” She has given permission to publish this information, and wants everyone to know she’s fine. “The President’s support of the project was critical,” says Wolansky. UConn Health doctors can now schedule MRIs for their patients at the BIRC in Storrs for Monday and Wednesday afternoons as easily as if they were going to the imaging center in Farmington. Urgent scans can be squeezed in at other times on a case-by-case basis. The BIRC capacity will free up some space at UConn Health, bringing new patients into the system, and is not expected to impact research done at the center at all. “The biggest benefit is the integration between campuses. It’s a huge success for us to do this,” says Hoeft, the director of BIRC, noting that revenue from the scans will enhance the financial stability of the center. Wolansky, who is based in Farmington, agrees. UConn’s Farmington and Storrs campuses function largely independently from one another, so this collaboration is based on goodwill, he says. The Society for Neuroscience (SfN) recently awarded BIRC Scientifc Director Fumiko Hoeft the Science Educator Award. This award, supported by The Dana Foundation, “honors an outstanding neuroscientist who has made significant contributions to educating the public about neuroscience.” Congratulations, Dr. Hoeft! Abstract: A comprehensive understanding of the neural processes for speech production is critical for theory and practice with direct influence on the capability for early identification of typical and atypical development and aging and the development of innovative and optimized treatment regimes. For the most part, the neural processes instantiated in models and theory are incomplete due to an almost exclusive focus on task-induced activation (TIA) and the positive BOLD response (PBR), to the exclusion of task-induced deactivation (TID) and the negative BOLD response (NBR). A related limitation are approaches that fail to fully account for the complex network level interactions that contribute to both sensorimotor and cognitive control for speech. Our recent approach focuses on the identification of functional networks (FN) and the contribution of both activation and deactivation, to gain a comprehensive representation of the neural processes for speech production. The approach is providing insight into brain-behavior relations and in identifying typical and atypical neural organization not easily identified using standard fMRI approaches. The presentation will include recent data on the positive and negative BOLD signal contributions to speech production including an overview of the potential importance of the negative BOLD signal. In addition, neuroimaging data on individuals who stutter will be presented as a model to understand the impact of neurodevelopmental deficits on neural organization. Bio: Vincent Gracco is currently a Senior Scientist and Vice President of Scientific Operations at Haskins Laboratories. He was a Professor in the School of Communication Sciences and Disorders, McGill University from 1999-2015 and was Director of the Centre for Research on Brain, Language and Music, McGill University from 2008-2015. His research focuses on the neuroscience of human communication using multiple neuroimaging modalities and physiological techniques. Current research areas include the neural control of spoken language, sensorimotor dysfunction associated with stuttering and other speech motor disorders, speech motor learning, bilingualism and the relationship between language and music. Abstract: Depression in late life has been associated with cognitive decline and new onset of dementia. Recent studies have linked the presence of neuroticism with cognitive decline among older depressed adults. Structural Imaging studies in geriatric depression have found that hippocampal volume and burden of white matter hyperintensities are associated with cognitive outcomes. Functional magnetic resonance imaging (fMRI) has recently been used to study late-life depression. Preliminary findings of fMRI in older adults have examined the relationships of neuroticism and depression, identifying the medial prefrontal cortex as a key area in emotion regulation and susceptibility to depression. Speaker Bio: Dr. Steffens has been funded by the NIH for over twenty-five years. His research focuses on links between late-life depression and subsequent cognitive decline and development of dementia. Assessments include structural and functional brain imaging, neuropsychological testing, blood work for peripheral markers and genetics, personality assessment, functional status, and measures of stress and social support. There is a scheduled power shutdown on South Campus starting Saturday 10/13 at 8PM and ending Sunday 10/14 at 8PM. The BIRC facility will not be accessible during the shutdown. The NiDB, wiki, and scheduler systems will not be affected.